Although we began the game slowly, with many mistakes, we managed to turn things around in the second half and came away with a confident win in the league. The game began with a double by Betti, to which Bach answered back at the other end, and then Aleks made two free throws (3rd minute 4-2). Approaching the middle of the quarter the two sides were head-to-head, but by then Vasas were a small step ahead (5th minute 4-5). After that we took the lead with a 6-0 run thanks to the points coming from Debi and Yvonne, from which Varga scraped off two points with two free throws, and later on the guests even managed to tie the game up (10-10). By the end of the low-scoring first period we were in a small lead with a successful free throw by Tina (10th minute 14-13). Heljic opened the second quarter with a double, to which Amanda answered back from under the rim, and then the guests got in the lead again following a triple by Vukov (12th minute 16-18). Vasas increased their lead with a double by T�th, but after that we took over control, and turned the game our way with a 9-0 run (25-20), and then we forced the guests to call a time-out with two quick baskets by Betti and Debi, because the difference has reached ten points for the first time in the game (17th minute 30-20). Vasas were able to score again after a 16-0 run, but Debi was able to answer back to Heljic's lay-up with a triple right away. The eleven-point difference for half time was set by two free throws by Bud�csik (20th minute 35-24). The second half began with four quick points by Betti Hat�r, while at the other end Vivien B�r�ndy was able to score. However, the guests were still unable to stop Betti on defense, she kept increasing our lead with yet another basket (23rd minute 41-26). 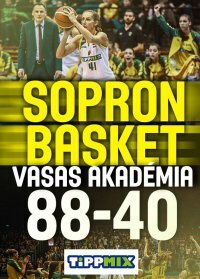 In the next minutes Vasas managed to slightly cut into their deficit, but then after a steal by Yvonne the earlier 15-point difference was restored, what's more, with yet another basket by our point guard and a mid-range double by Debi the away side was forced to call another time-out (27th minute 52-33). After the break we got into a 20-point lead following a free throw by Bud�csik and a double by Debi, and by the end of the period we have made our advantage even more confident (30th minute 59-36). A free throw by Tina launched the final stage of the game, to which Aleks added a three-point play after grabbing an offensive rebound, and with Vir�g's open three we were already in a 30-point lead (32nd minute 66-36). After a double by Debi the guests have scored their first basket of the period, but then it was Debi again who scored from downtown, to which Bach answered back from the free throw line (71-40). We closed the game with a 17-0 run led by our young players which resulted in a confident win over Vasas (40th minute 88-40). Roberto Iniguez: We starter very slowly, without focus and energy. After half time we understood what we had to do and everything changed. We played our own game, and players from the bench also entered the game well. Kamilla Varga: Congratulations to Vasas, they fought restlessly until the end. They gave us a very hard time on the first half. However, we didn't play in the rhythm we are used to either. We weren't able to execute what the coach wanted us to do. We managed to improve on that after the break. We found ourselves and our game got rhythm and pace. In coming days we will have fewer games, but more practice, which will be a good preparation for what is coming later. 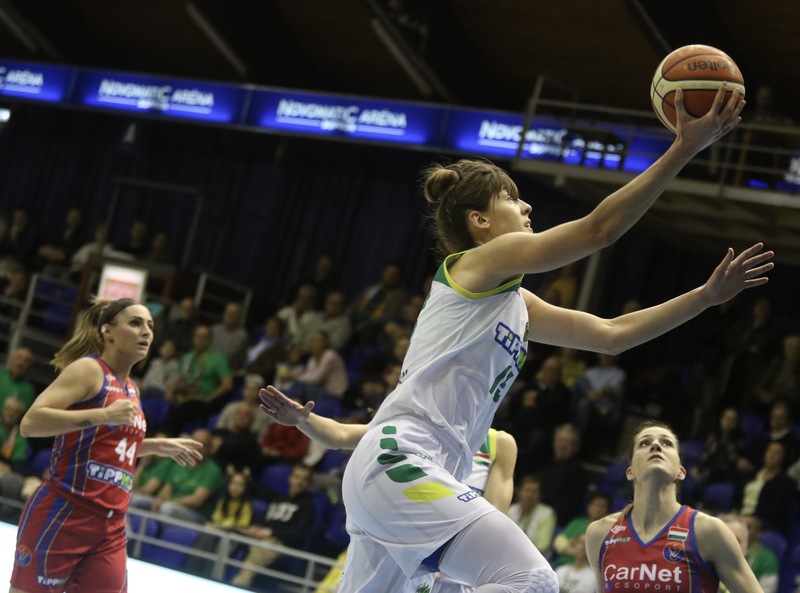 F�ldi Attila: Congratulations to Sopron for their achievements in the season so far, and also to Bogi who surprised herself with a great performance for her birthday. We tried to do everything and fight but as we got more and more tired in the second half mentally and physically, the difference got bigger and bigger. I think we could have played a tighter game than this. We will try to fix our mistakes and collect wins in the last two games! Bogl�rka Bach: First of all, congratulation to Sopron for making it into the FINAL4! It is a great achievement, hats off to that! We knew how strong they were, but we came here trying to make them fight. We managed to do that in the first half, especially in the first quarter, but then we started making more mistakes on defense and on offense. They deserved to win! If we were a little more consistent, the difference could have been smaller.